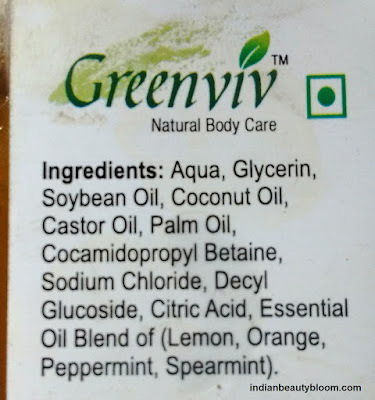 Today I am going to review one more product from brand Greenviv . It’s Minty Citrus Hand Wash Review . 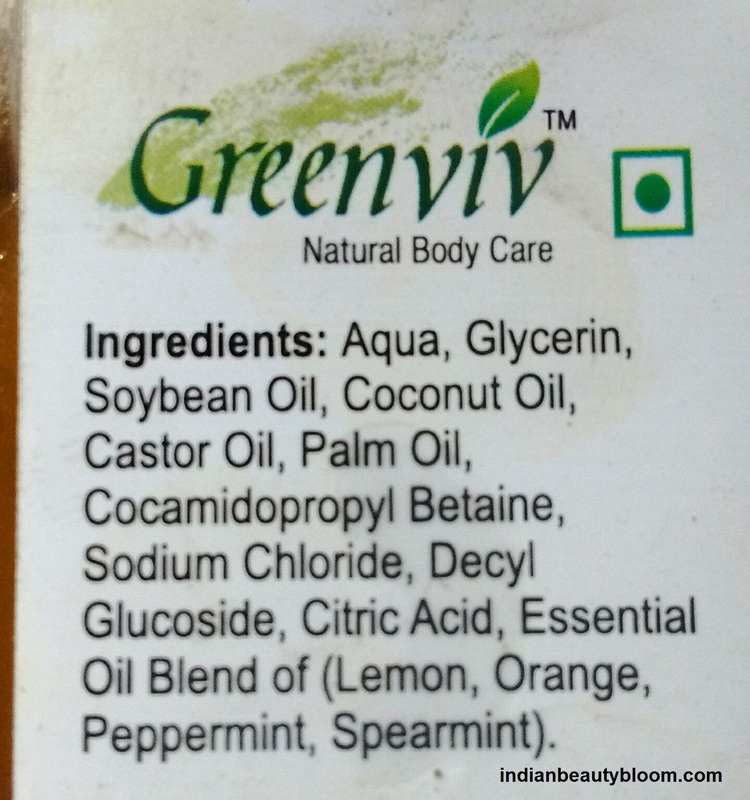 Greenviv is an Indian brand and it’s products are Natural , Vegan , Paraben free , Sulfate free , SLS free. They have wide range of products in Skin Care , Hair Care , Bath & Body , Baby Care range . 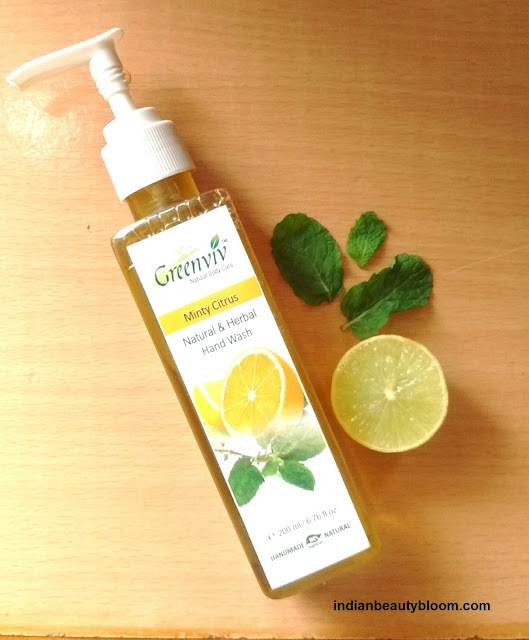 This Minty Citrus Hand Wash is an excellent product with goodness of Glycerin , Coconut oil , Castor oil etc and it cleanses the hand and also moisturizes it without making it dry or rough . The hand wash comes in a good quality plastic bottle with a nozzle at the top from which little quantity of it can be easily taken out and used . 1. A herbal product with natural ingredients . 2. Free of SLS , Sulfates , Parabens . 3. Free of artificial color and preservatives. 4. 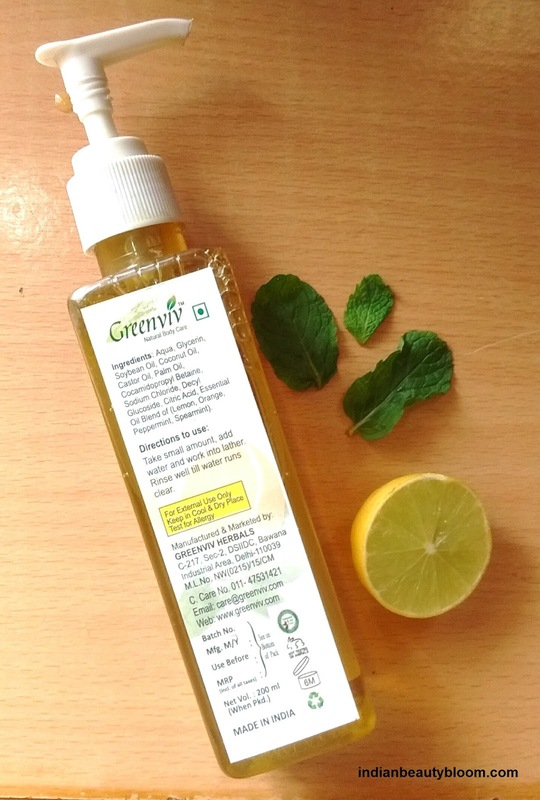 Has goodness of Coconut Oil , Castor Oil , Palm oil and Some Essential oils like lemon & Citrus Essential Oil . 5. Product Packaging is good . 6. Sufficient shelf life for longer use . 7. Not tested on animals so Cruelty free. 8. Cleanses the hand properly and does not makes it dry or rough . 1. Availability might be an issue as available only on online stores . 2. Fragrance is too strong , some people might not like it . I am using this hand wash past few days and it’s good . It’s a light yellow color hand wash with thick consistency and a strong fragrance which is a mix of Citrus & oil fragrance . It’s quite effective in cleansing the hand properly and the best part is it does not makes hand dry or rough as it happens in case of many soaps . Much better than usual soaps and hand wash which are laden with chemicals which makes the hand dry & rough .